Here’s a little nod in the direction of a newcomer to the studio market from the Godlike Genius (as heralded by NME in 2013) Johnny Marr. The immensely talented British singer, songwriter and guitarist has been using the Meris 440 Mic Pre to record in his studio since 2015 and evidently loves its classic sound. Most recognised for his work as guitarist and co-songwriter with Morrissey in UK alternative rock band The Smiths, Marr released his latest solo offerings, “Playland” and “Adrenalin Baby: Johnny Marr Live” in 2014 and 2015 respectively to international acclaim. “For a mic pre that’s class and classic, the Meris 440 is the one”. The 440 features all analogue circuitry with Cinemag™ transformers and an ingenious effects loop which allows the use of guitar pedals to effect anything you put a mic in front of, be it vocals, acoustic instruments or guitar cabs. If anyone was to know, Johnny Marr would. In 2012 Fender honored the guitarist by issuing an artist signature model – the Johnny Marr Signature Jaguar, a replica of the Jaguar he’s been playing since 2005. 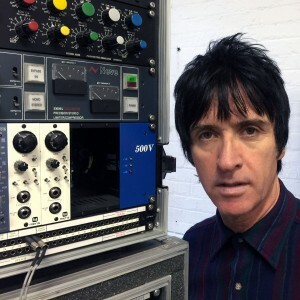 Apart from his solo work and career with The Smiths, he’s worked with bands and artists including The The, Modest Mouse, The Cribs, The Pet Shop Boys and Beck, to name but a few, and now fronts his own band called Johnny Marr and the Healers. Johnny is continually working on new material in studio and is set to perform two nights at Wembley Arena in London in April.